Red Rock Canyon National Conservation Area, 17 miles west of Las Vegas, showcases Red Rock formations and Sandstone formations such as the Keystone Thrust and Calico Hills. The stunning sunsets and landscapes are a stark contrast to the lights of Las Vegas only 17 miles away. 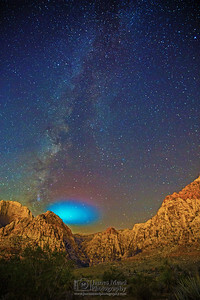 This is photography of Red Rock Canyon National Conservation Area. 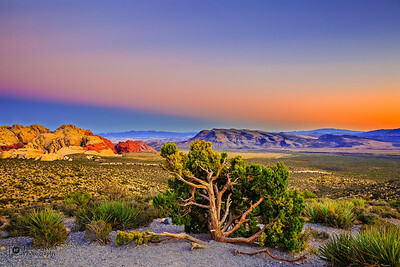 The belt of Venus begins to show while backscattering illuminates the sky at sunset as lights of Las Vegas peak out from behind the Calico Hills and a Utah Juniper in Red Rock Canyon. 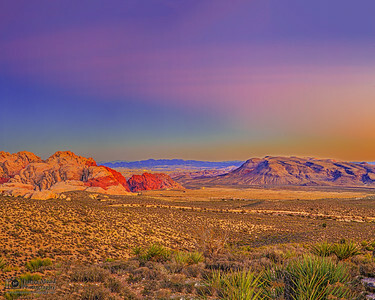 As the sun sets, the belt of Vegas begins to creep up into the sky while the night lights of Las Vegas begin to show from behind the Calico Hills and Guardian Angel of Red Rock Canyon. As Twilight sets in, the bright lights of Vegas begin to show from behind the Calico Hills and the Guardian Angel of Red Rock Canyon. The light from the Luxor can be seen shooting up into the sky from behind the Calico Hills.